How Does Mesothelioma Differ from Other Lung Cancers? Mesothelioma is a form of cancer that most often develops in the lungs, but there are significant differences between mesothelioma and other types of lung cancers. 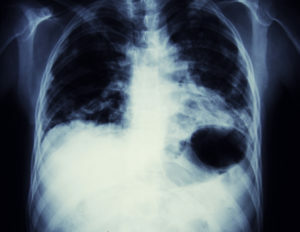 A chest X-ray shows the presence of small cell lung cancer. Smoking tobacco products is responsible for nearly all small cell lung cancer cases, and it also causes a majority of non-small cell lung cancers. Prolonged second-hand exposure to smoke is another common contributor to lung cancer. Exposure to the carcinogens in cigarettes and other tobacco products damages the cells in the lungs and contributes to mutations that eventually create tumors. Lung cancer may also be the result of exposure to radon gas or other toxins. People with a family history of lung cancer face an increased risk for the disease, and in rare cases lung cancer develops in individuals with no known risk factors. 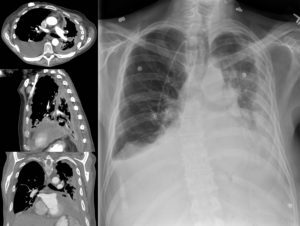 A chest X-ray and corresponding CT scan images show the spread of pleural mesothelioma. Unlike lung cancers, mesothelioma is caused specifically by asbestos exposure, most often through occupational exposure although second-hand contact with asbestos can also lead to mesothelioma. When inhaled, the particulates from asbestos fibers can become embedded in the body’s mesothelium, which is membranous tissue that lines or surrounds most internal organs. Over time, these particulates inflame the tissue and trigger cellular mutations that cause the development of tumors. Another key difference between mesothelioma and lung cancers is in their pathology, or how the diseases develop and behave. Lung cancers occur within the lungs themselves while mesothelioma develops in the mesothelium, most often the pleura, which is the protective mesothelium that surrounds the lungs. In lung cancers, tumors generally grow in individual, distinct masses that are confined to the boundaries of the lungs, although lung cancers can—and often do—spread to other parts of the body. As mesothelioma metastasizes, it typically forms a network of nodules within the mesothelium that progressively creates a tumor around or within the affected organ. These growths may also spread into other local internal tissues. Mesothelioma and lung cancers also differ in their latency periods, or the span in which the diseases exist but have yet to manifest signs and symptoms. Lung cancer indicators typically appear sooner than mesothelioma symptoms. Most types of small cell and non-small cell lung cancers have a latency period of 10 to 30 years, although there are various factors that impact the onset of the cancer, including whether the individual was a smoker and how regularly he or she smoked. Mesothelioma generally takes between 20 and 40 years for symptoms to become apparent, and in some cases the latency period may be more than 50 years. Mesothelioma’s long latency period can make it more difficult to diagnose in its early stages than most types of lung cancer. To reach a mesothelioma diagnosis, a doctor will begin by looking into a patient’s medical history and their risk factors. If you had occupational exposure or second-hand exposure to asbestos at any point in your life, it’s important to inform your physician. Your doctor will then assess potential physical indicators and check for fluid in the lungs or abdomen. Additional diagnostic measures may include a blood test and various forms of medical imaging to look for abnormalities and rule out other conditions. Ultimately, a biopsy of tissue in the affected area will determine whether mesothelioma is present. Lung cancer diagnosis follows a similar path, although some of the preliminary diagnostic steps may differ. For example, if a patient has a recurring cough that produces sputum (a mixture of saliva and mucus that originates in the respiratory tract), inspecting the substance microscopically may reveal the presence of cancerous cells. Treatments for both mesothelioma and lung cancers depend heavily on how far the disease has advanced. In most cases, treatment involves a combination of surgery, radiation therapy and/or chemotherapy. If the disease is diagnosed at an early, localized stage, tumorous growths may be partially or completely removed by surgery. In lung cancer cases, this may involve extracting a portion of the affected lung or removing the lung itself. For mesothelioma, this may entail removing the lining of the lung, the impacted portion of the lung, or the entire lung. Sadly, mesothelioma is often not detected until the cancer is in an advanced stage. There is no cure for mesothelioma, and the goals of mesothelioma treatment are to relieve symptoms, extend lifespan and improve quality of life. Financial compensation is available for mesothelioma patients, including money from trust funds that were set up to pay asbestos-related health claims on behalf of companies that manufactured asbestos or whose employees had contact with asbestos-containing products. Led by New York asbestos exposure attorney Joseph P. Williams, The Williams Law Firm has helped mesothelioma victims and their families from across the country recover the financial security they need to deal with medical expenses and other costs associated with mesothelioma treatment. If you or a loved one was diagnosed with mesothelioma, please call us today at 855-575-MESO (6376) or contact us online for a free, no-obligation consultation. The Williams Law Firm is based in New York, but we work with asbestos exposure victims nationwide. We can arrange to meet with you at your convenience via video conference or in the comfort of your own home.